Using named day delivery: Order this product within 14 hrs and 56 mins for guaranteed Saturday delivery. Looking at this gorgeous gift box will leave you in no doubt of its star potential. 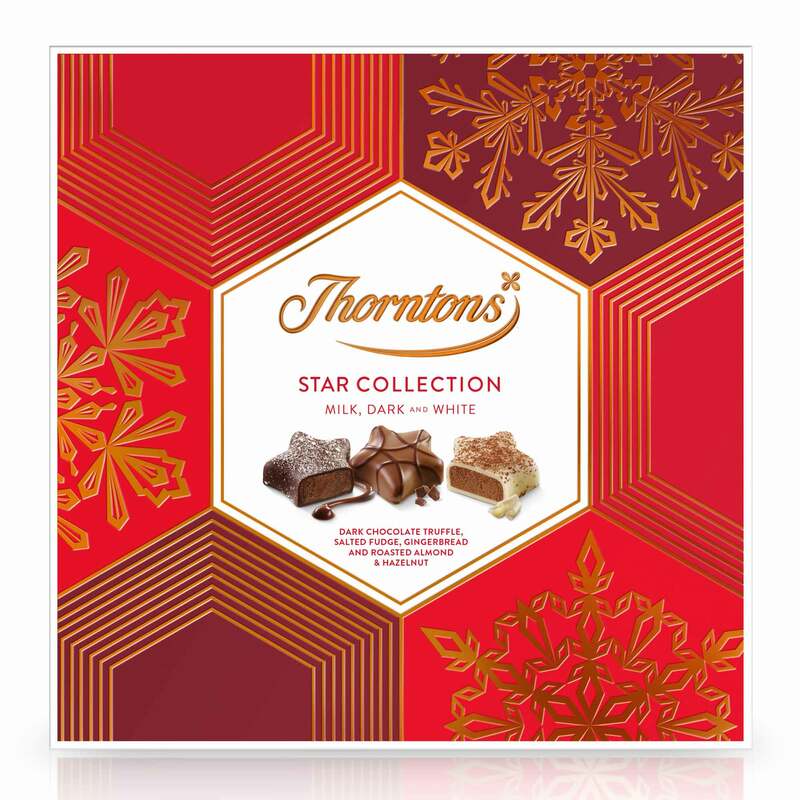 Elegantly designed, it is the perfect home for beautifully crafted, star-shaped milk, white and dark chocolates, including pralines, truffles, honeycomb and fudge. So not only is it a feast for the eyes but there is also a chocolate for every taste. Which chocolate shines brightest for you? Is it the soft, sumptuous Chocolate Truffle Star? Or maybe the Crunchy Praline Star? 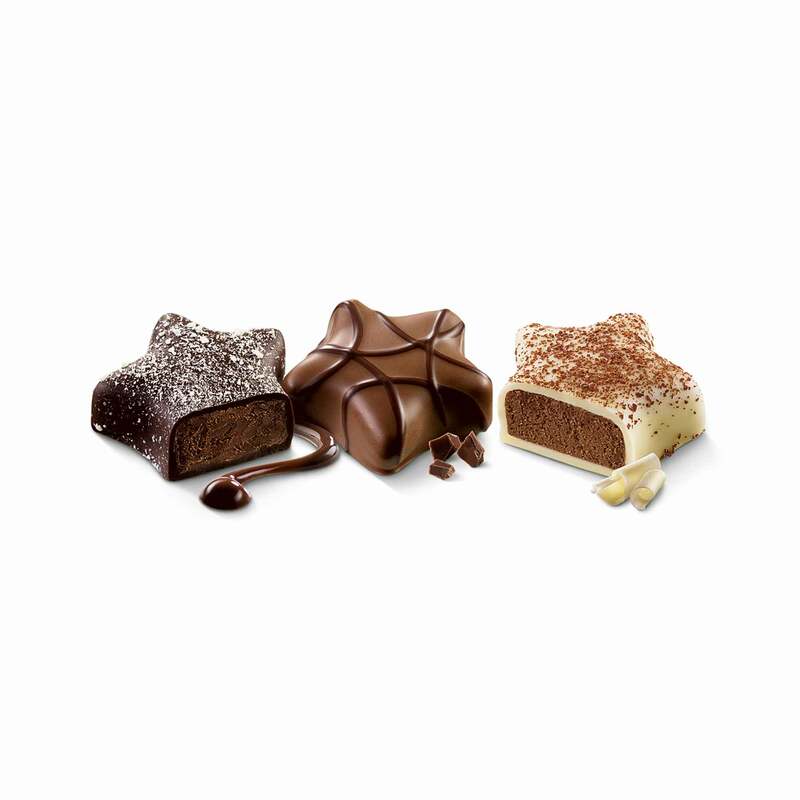 Then there's still the silky smooth Creamy Fudge Star and the popular Honeycomb Star to try. Sugar, cocoa mass, cocoa butter, dried whole MILK, palm oil, ALMONDS, glucose syrup, HAZELNUTS, double cream (MILK), sweetened condensed MILK (whole MILK, sugar), lactose (MILK), humectant (sorbitol), dried skimmed MILK, fat reduced cocoa powder, butter (MILK), coconut oil, MILK fat, rice flour, emulsifiers (SOYA lecithin, E471), flavourings, invert sugar syrup, sea salt, dextrose, salt, dried EGG white, raising agent (sodium bicarbonate), spices (ground ginger, cassia), MILK protein.